If you thought lettuce was only good for salads or on sandwiches, you should try a bowl of lettuce soup because the new dimension presented will be a most pleasant surprise. 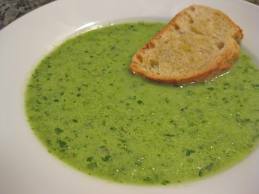 Lettuce soup is a good way to enjoy a ,healthy green leafy vegetable. I've never heard of lettuce soup before, but that actually sounds really good. I think you may have the most unique L post I've read today. never would have imagined it--sound awesome! ooh now this one is different, will have to give it a try. On Diners Drive Ins and Dives they showed a place that made Cheeseburger soup which had lettuce in it. DANIELLE L ZELCHER: Thank You, I'm happy that you liked it. LYNN PROCTOR: It is actually a very good soup. RCH: Lettuce soup is a little out of the ordinary but quite good. I am so excited that you are doing soups! I made an escarole soup for the first time last year. It was delicious and I imagine this soup would be as well. Look forward to more posts. Janna: Yes escarole soup would be delicious. Thank You for calling.